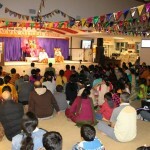 Categories: Bhagavatam Lectures, Madhura Utsav. 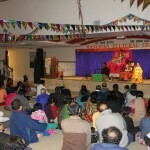 With the blessings of Lord Sri Hari and Sri Swamiji, ‘Madhura Utsav – Srimad Bhagavata Saptaha Mahotsav, 2013’, organized by the Dallas GOD Chapter, commenced at the Pebble Creek Montessori School in Allen, TX, on November 23rd 2013, a cold Sunday morning amidst the threat of extreme weather conditions. 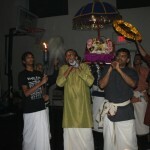 But this did not deter the devotees who transformed the gym at the Montessori School into a divine place of worship. 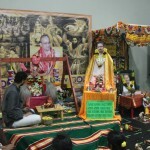 On one side of the stage, a small Mandap was erected and decorated for the Divine Couple and Sri Swamiji. 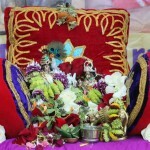 The other side was adorned by different statues of Krishna depicting the divine plays of the lord. 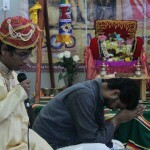 With Nama Sankirtanam being recited, the Utsav started with the Ganapathy Pooja by offering a prayer to remove any obstacles that might be encountered during the Saptaha event. 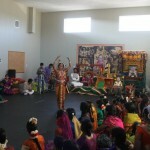 This was followed by Guru Archana as part of Srimad Bhagavatam Pooja. Sri.Ramanujamji initiated the Bhagavata Parayanam with the recital of the Dhyana Slokas. This was followed by the recital of the first 6 chapters in Bhagavata Mahatmyam, interspersed with explanations in the form of stories and kirtans. 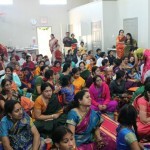 The devotees were then served delicious lunch Prasad that was sponsored by Smt. Prasannaji and Mrs. Nithyaji. The divine couple was taken in a procession. 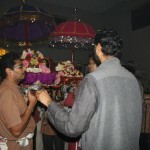 Songs from Thodaya Mangalam were rendered by Sri A. R. Natarajanji during the procession. 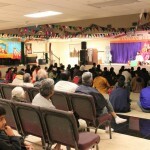 The devotees then headed to the Karya Siddhi Hanuman Temple in Frisco, TX for ‘Bhagavatamrutam’ –Discourse in English by Sri. Ramanujamji. 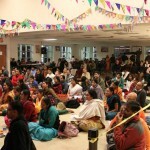 Despite the treacherous weather conditions, the discourse was attended by nearly 125 devotees, who were fortunate to hear Sri. Ramanujamji’s Bhagavata Mahatmyam. He delineated, the history of Srimad Bhagavatam and the reason it was made available to humans in this Kaliyuga by narrating the story of Sage Narada. After the Arathi at the Hanuman Temple, the devotees were served delicious Mahaprasad sponsored by Sri. 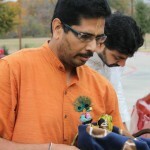 Srikanthji and Mrs.Manjulaji. 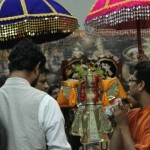 The devotees followed Sri. 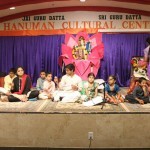 Ramanujamji back to Montessori school and were immersed in divine bliss singing kirtans composed by Sri Swamiji. 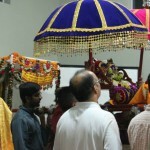 This was followed by Dolotsavam that concluded a blissful first day of the Madhura Utsav by Dallas GOD. The entire day was threatened by a weather forecast of icy rain, sleet, and dangerous driving conditions. 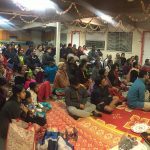 However, until the day ended and all the devotees reached home safely later in the night, the treacherous weather was kept at bay, as a testimonial to Bhagavan’s love and compassion towards his devotees who attended this Madhura Utsav. 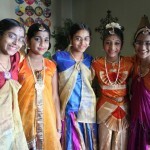 The second began with the recital of Vishnu Sahasranamam at the Pebble Creek Montessori School. 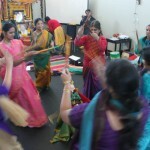 This was followed by the Pancha Stuti recital led by Sri. Ramanujamji. The devotees were then served delicious lunch Prasad prepared by GOD volunteers. 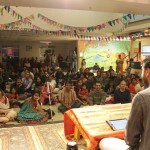 The afternoon continued with rendition of Ashtapatis led by Sri. 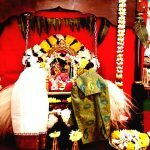 Natarajanji. 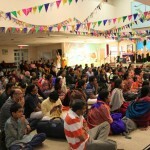 In the evening, the devotees were immersed in ‘Vaishnava Mahatmyam’ that was beautifully expounded by Sri. 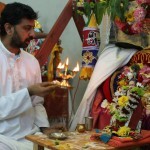 Ramanujamji. 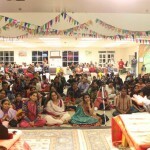 Close to nearly 125 devotees listened to this discourse in rapt attention. After the discourse, the devotees were served delicious Mahaprasad, who then headed back to Montessori School for the rendition of Sri Swamiji’s kirtans followed by Dolotsavam. 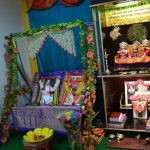 On the third day of Madhura Utsav, the devotees eagerly awaited the arrival of the Divine Couple Sri Madhuri Saki sameta Premika Varadhan in all their glory and splendor. 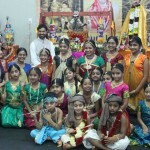 They were welcomed to several Sri Swamiji’s kirtans. Sri. 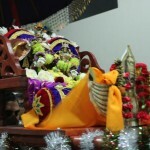 Ramanujamji mounted the deities on a specially decorated swing. 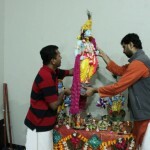 After the customary Poojas and incantations, the devotees were presented with the long awaited darshan of the Divine Couple in their entirety to the Parayanam of the Dasama Skandam and Krishna Jananam. Lord Krishna was carried by Vasudevji, portrayed by Sri Mayaji, along with the Adiseshan in a procession to symbolize this celestial event. 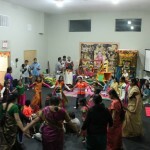 The birth of Lord Krishna was celebrated blissfully by young and old alike, with song and dance. The weather in the DFW Metroplex that had been cold and gloomy until that day suddenly saw bright sunlight breaking through the clouds, to rejoice the birth of our Lord Sri Krishna! The evening discourse at Karya Siddhi Hanuman Temple was attended by nearly 250 devotees who got to listen to the ‘Star Bhagavata’ through the Dhruva Charitra. After the Mahaprasad, the devotees concluded the evening with the rendition of several kirtans composed by Sri Swamiji and Dolotsavam of the Divine Couple, at the Montessori school. Sri Ramanujam ji explained the meaning of a few of Sri Swamiji’s kirtans in his own inimitable style. 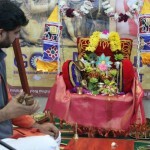 The fourth day of the Mahotsav continued with the celebrations of the deities with Parayanam of Dasama Skandam, singing the Ashtapadi and several of Sri Swamiji’s kirtans, along with the recital of the Vishnu Sahasranamam. Sri Ramanujamji extolled the ‘Grace of Bhagavan’ through the Ajamila Charitra, and also explained the Vritasura Chaturshlokhi in the evening. 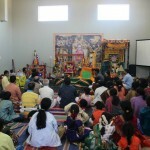 On Thursday, Dallas devotees got ready for another blissful day. 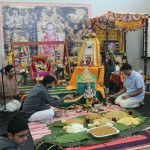 Sri Ramanujamji performed the Ekadasi Thirumanjam and Pooja, while Bhagavatha Parayanam was going on. 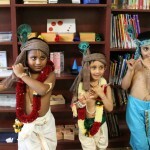 In the afternoon, all the little Gopikas were getting ready to do a dance performance of Sri Swamiji’s kirtans with not just one but three little Krishnas. 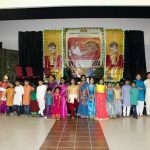 Dallas Gopakuteeram children were trained by Smt.Hema Kalyan, and the children portrayed the essence of Madhuragitam and devotion to Lord Krishna. 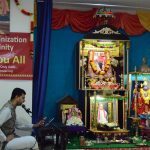 In the evening, Sri Ramanujamji’s discourse on Prahalada Charitram ( devotee’s love for the lord) in Karya Siddhi Hanuman temple reinforced how unflinching bhakthi and love for bhagawan, brings HIM to his devotee. Sri Ramanujam ji made sure everyone got the take home message that Mamakara (greed) and Ahamkara (Ego) can only be destroyed by Krishna bakthi. 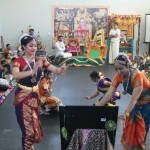 This was followed by Garuda Vahana Purappadu and Dolotsavam. Friday being Dwadasi started with Nama sankirtan, Prabodhanam and Parayanam and Sri Ramanujam ji performed Thirumanjanam and Pooja for the divine couple. 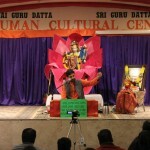 An ardent devotee from Guruvayur, Sri.Kesavan Nambuthiri Bhagavathar delivered a beautiful lecture on Krishna Bhakti. In the afternoon Gopa kuteeram children sang Sri Swamiji’s kirtans with such enthusiasm and eagerness, as the divine couple were silently watching over. As the sun started to set in, Sri Ramanujamji took all the devotees on a journey where everyone witnessed Krishna Leela, through the vivid explanations of the place, the setting, the scenario and the beauty. 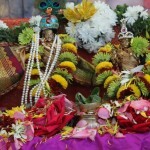 Sri Ramanujamji lucidly explained uniqueness of Lord Krishna avatar. 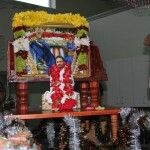 Following the discourse, the devotees gathered in large numbers at Montessori school for Janavasam. It was indeed a very beautiful sight to behold. 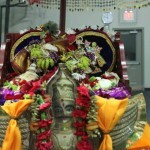 On Saturday, a grand Radha Kalyanam, the wedding of the divine couple was conducted in a very grand manner. The divine couple was united in marriage after the rendition of Ashtapatis. A grand Rajbhog lunch was served for all the devotees on this grand occasion. 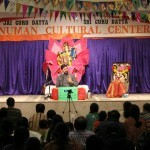 Sri Ramanujamji concluded his discourse series with a stunning lecture on Rukmini Kalyanam. 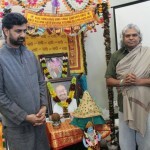 A special message from Sri Swamiji was telecasted, after which fellow devotees who were new to G.O.D. were initiated with Srimad Bhagawatham. 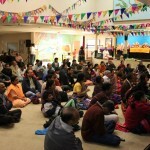 The seven-day, Madhura Utsav-Bhagavata Mahotsav 2013, at Dallas-Fort worth, that was attended by hundreds of devotees, were blessed with a memorable and eternal experience, bestowed by the Grace of Sri Swamiji and the immense blessings of the Divine Couple – Madhuri Saki sameta Premika Varadhan Thakurji!